Fun For All in Chile’s Atacama Desert. My children had never before taste-tested the caves they hiked through. But the walls of this cave, in the Valle de la Luna in Chile’s Atacama Desert, were covered in glassy stripes of solid salt that begged to be sampled. (Verdict: The passion-fruit ice cream in town was way better.) Our family had also never careened down a sand dune on a snowboard, hunted coral flamingo feathers, tracked spiral nebulae in the southern skies, or crunched along blinding-white salt-strewn paths that looked like they were covered in snow. sand dunes of ever-shifting hues. Explora and Awasi lodges in the small oasis town of San Pedro de Atacama make family-friendly bases for exploration. A maze of dirt roads, the town itself is lined with adobe buildings housing cafés, restaurants, outfitters, and craft shops. Considering the altitude (San Pedro sits at around 8,000 feet) and the stamina needed for active adventures in this otherworldly playground, the Atacama is best for families with children ages 10 and up, Pam Walker says. “For outdoor adrenaline junkies, it’s great,” she adds. A recent trip to the Atacama with my children, ages 10 and 13, proved Walker right. Arriving during the Chilean summer from rain-soaked Seattle, we biked, hiked, swam, floated, and studied the skies in a landscape of extremes: the light, the dark, the wind, the aridity, the wide-angle vistas. Here, six Atacama picks for stoking families’ outdoor passion. SANDBOARDING IN VALLE DE LA MUERTE. It’s a tough slog across Valle de la Muerte’s deep sand to reach the crest of dunes that top out at more than 300 feet. But rewards include views across undulating, salt-studded hills like dragon scales and red-rock formations resembling drip castles – and, of course, a thrilling downhill ride on a well-waxed snowboard. (Tip: If your boarding skills are lacking, simply ride sitting down, like on a sled.) Outfitters play music from their vans, and boarders of all ages and skill levels cheer each other on. After several epic tumbles, my son resembled a breaded cutlet; prepare to be covered head to toe in sand following a session. MOUNTAIN-BIKING THE CATARPE VALLEY. The valley’s lush green, fed by the meandering San Pedro River, is a welcome contrast to its red, sunbaked rock walls that morph from bulbous to jagged. Algarrobo trees offer shade for requisite snack and rest stops. A mostly flat ride along a dirt road (cars are rare) winds along the river past the whitewashed San Isidro chapel. Teens who want a challenge (mine did not) can pump up the Altos de Catarpe, a steep, narrow, potholed road hemmed in by dramatic deep-crimson walls. Or seek out the old tunnel (headlamps are vital) that ends with expansive views of the salt ridges. FLOATING LAGUNA PIEDRA. 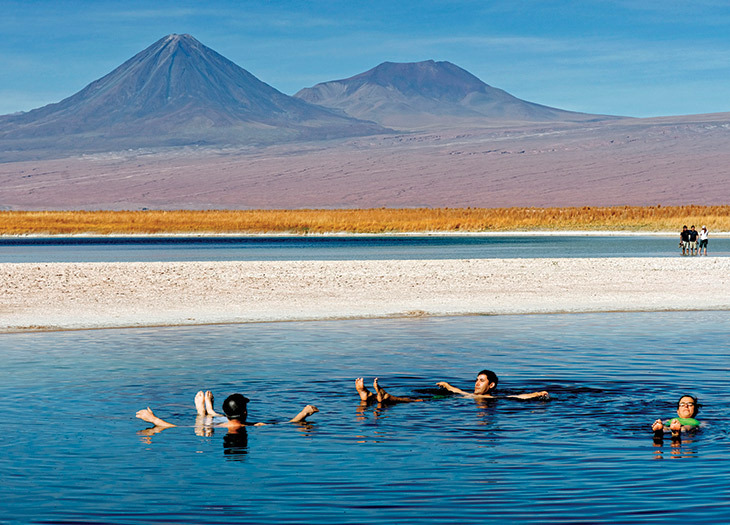 Part of Chile’s largest salt flat, Laguna Piedra is the Atacama’s answer to the Dead Sea. The flat, turquoise-to-emerald lake’s salinity is so high that you float effortlessly while Baird’s sandpipers feed in the shallows along the salt-encrusted perimeter. It’s cool, figuratively and literally: The water is brisk at first plunge (have towels at the ready for when the kids emerge; the frequent stiff breeze is bone chilling). My kids deployed their newfound buoyancy to test out some aquatic acrobatics. Some visitors scoop the mineral-rich mud for DIY facials; I passed, thanks to its sulfur smell. Use the outdoor showers or follow up with a dip in the nearby freshwater Ojos del Salar, two perfectly round side-by-side sinkhole lakes that look like a pair of eyes carved out of the pancake-flat ground. HIKING THE GUATIN GORGE. Treat a hike along a footpath Atacameños have used for centuries as a scavenger hunt for puma tracks, cardón cacti, and fragrant medicinal plants such as pingo-pingo, as well as the chance to spot the well-camouflaged (and utterly adorable) bunnylike viscacha, a chinchilla relative, sunbathing on the rocks. Throw in archaeological remnants such as obsidian blades, a cactus-wood-roofed stone shelter used by local herders, and mortars and pestles worn smooth from use, and top it off with the knowledge that the highly endangered Andean cat still prowls this area, part of Explora’s 33-square-mile nature reserve. STARGAZING. Dry, cloudless Atacama nights (more than 315 per year by some estimates) make for some of the best stargazing on the planet. In fact, observatories here include the world’s biggest astronomical project, ALMA, just outside San Pedro, whose mission is to discover our cosmic origins. It’s an acronym for Atacama Large Millimeter/submillimeter Array, but alma in Spanish also means “soul.” I can’t claim my kids got in touch with their souls, but they did connect with their inner astronomers, tracking the Southern Cross and other austral constellations and marveling at the surreally clear images of a luminous, crater-pocked moon they shot with a mobile-phone camera through a powerful telescope. 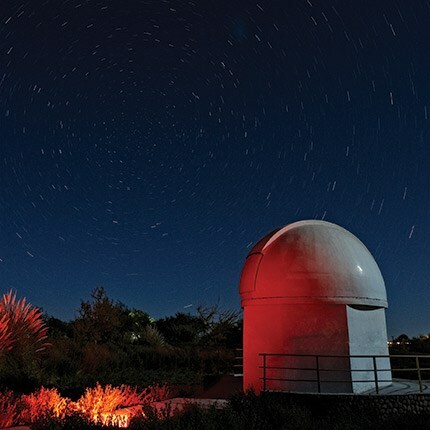 See Jupiter rise over the Andes, scan for shooting stars, and ogle the Milky Way. SOAKING IN THE PURITAMA HOT SPRINGS. Tucked into a red-and-white rock canyon at 11,500 feet, the springs felt transcendent after our hike across parched landscape. My kids chased the tiny black fish that share the eight crystalline, 86- to 92- degree rock pools carved from the thermal, mineral-laden Puritama River; watched electric-blue dragonflies and golden finches flit through the dense pampas grass and foxtails lining the pools; and scouted a prime spot under the mini waterfalls that cascade from one pool to the next. as a 12-mile horseback ride through the dunes, a half- day bicycle ride along dry riverbeds through the Piedra de la Coca petroglyphs, or a ramble in the multihued Valle del Arcoiris (Rainbow Valley). Weekly barbecues at the 39-acre compound include Andean music and dance. The 50-room lodge is closed for an overhaul following a fire earlier this year, with a reopening set for January 2017 that will add new terraces and outings, including the option to stay at Explora’s altiplano camp. Children ages 5 and up are welcome at Awasi Atacama, whose ten thatched-roof, cottagelike rooms crafted of adobe, stone, and wood mimic the designs of local pre-Inca structures. Mix a family cooking, weaving, or pottery class with tailor-made excursions, from a hike to the site of a pre-Columbian fortress for sunset views over the salt flats to a picnic next to an ancient carob tree carved by sixteenth-century Spanish conquistadors in a tucked-away village of limestone houses. the salt lake, and a meal with a local family. EAT: Heladería Babalú offers inventive ice cream infused with native flavors such as algarrobo (carob), chañar (fruit from the Chilean palo verde, with a maple-syrup-like flavor), coca leaf (yes, that coca leaf), and the herb ricarica (similar to sage), as well as accessible classics like chocolate. Caracoles 140 near Domingo Atienza. Pizzeria El Charrúa turns out fast, quality, Uruguayan-style thin-crust pizza with toppings both familiar (garlic and mushrooms) and local (choclo – starchy Andean giant corn). Tocopilla 442 between Cara- coles and Gustavo Le Paige. Changing its fixed-meal menu daily, Baltinache features indigenous Atacameño- Mapuche fusion fare, such as kebabs made from guanaco (a llamalike animal) and chañar mousse. Reservations are essential. Domingo Atienza near Palpana.